It’s starting. I’m aging. The grey’s aren’t even sparse in my hair anymore. A recent study found that the average age a women starts to feel old is 29, and buddy in a few days, I’ll turn 29. Yikes! In preparation for the be 3-0, I’ve decided to do a 30 before 30 list. You know… A bucket list of big things you want to do before you turn 30. I’ve got some big life events on the list that I know will happen next year as well as many things that I feel like I should have done while I was young, but was too busy studying or working to do. I want to do thinks like learn how to bar tend and play darts while I’m still young enough for these things to be socially acceptable. No, I’m not going to quit my career and go work at a Coyote Ugly type bar, but a girl my age should no how to mix a martini or margarita for her girl friends when they come over to watch a chic flick. Not all of my list is young and silly. Also included on the list is 30 random acts of kindness. They don’t have to be huge. I can pick up the tab for a mom at Subway getting her kids lunch or offer to take a shopping cart back when someone has their hands full. There is no doubt that my first 30 years have been a blessing, and I think it will do my soul good to mindfully do nice things for others over the next year. That’s my plan. The clock started ticking on my list… 30 things in about one year… I better get busy. There is a great problem with falling in love. You wake up every day certain you know why you exist. You wake up knowing the world is a kinder, gentler place that is more perfectly beautiful than reality should yield to. You wake up knowing the sun shines for a reason and you are just silly enough to believe it must be for you… The plural you; the you that is two individuals yet one partnership– not the singular you. There is a great problem with falling in love. You inch out on a limb convinced that it will be strong enough because that limb is in fact the strength of your partnership. You lose your breath from a simple smile across the room. It is sun rise on the fullest joy in life and for one of you, it will be there past sunset. There is a great problem with falling in love. It’s unbearable. It’s un-bury-able. It means that years later when a handsome young man brings me flowers and holds me til early hours in the morning, I still think of my love. I am awfully young to live the rest of my years alone. I could do this literally or simply by going falsely through the motions with a handsome kind man who I want to care for. Really, I want to. I do. It’s just there is no way to compare. There is a great problem with falling in love. The Fourth of July is rapidly approaching and that means one thing to me. Family. On one hand, it will kill my soul to have my first Fourth without my dad. Now, I know that seems like a stretch for most. But, my dad LOVED the Fourth. He sparkled with childhood over it. It was BBQ’s, swimming in the lake, fireworks, roasted marshmallows, family and none of the bull that comes with the more commercialized holidays. We love the Fourth. In preparation of bribing my nephew to love me, (yes, I’ll stoop really low) I went to BuyBuyBaby to gather the bait. Curious George is his love. My nephew, Matthew, is my love. And, so it seems only logical to bring all that love together by getting him a plush new Curious George stuffed animal. Now, I’m sure the women was just in “complement everyone on their babies mode.” But really. That’s almost as harsh as being asked how far along you are, when you aren’t even pregnant. The real win came though when I was able to turn Curious George around watch the expression on her face change. I said nothing. Just smiled and sauntered on. And, no, my babies would not look like stuffed monkeys. Hope you and the monkeys in your life have a very happy Fourth of July too! Our society is so messed up. Being a size 8 now, I could only be a ‘plus size model’, except for the fact that I only stand 5’6”, which makes me entirely too squatty for that. No, I have no desire or care to model, but these ridiculous standards exist. It appears the only way you earn the right to feel good about yourself as a woman is to eat carrot sticks all day and be a Lulu Lemon yoga model. I recently re-entered the dating world, and oh my goodness… At first I was annoyed that men treat me like a little fatty. But, I’m starting to feel that they have been culturally fed these standards of what an acceptable girlfriend should look like. No doubt, I want to date a healthy man. I want someone who could possibly enjoy going hiking with me or join me in a crossfit workout. But sheesh, the shallowness of it all is too much. I suddenly need to lose another 30 pounds and wear tons of makeup to be considered acceptably, moderately attractive. What’s up with that? I guess the final blow came when I was told that ‘men like thick girls.’ Good grief guys. What a backhanded, ASSinine comment. Society wouldn’t even let me feel good about myself, even if the little voice inside me told me I should be happy about myself. I’m not looking for women to jump to my defense. I’m not looking for comments about how I am in fact not ugly or even that I am pretty. 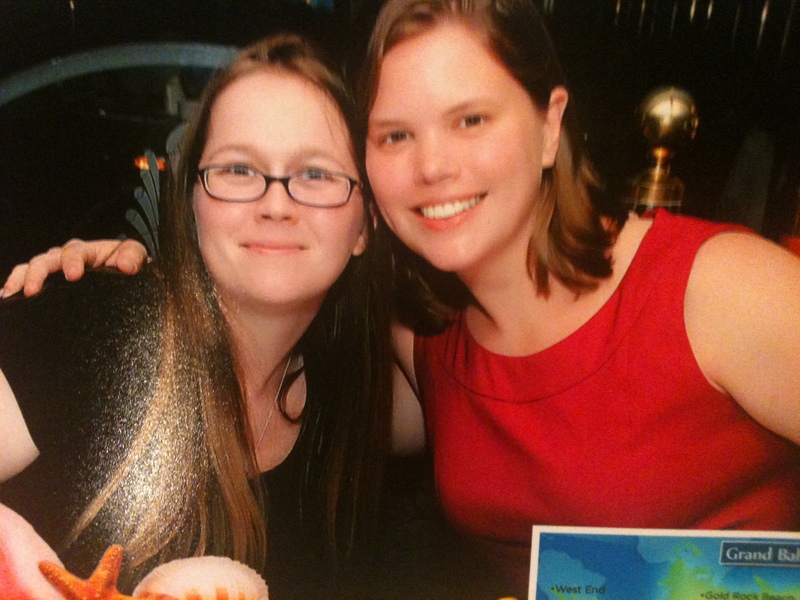 But here is a picture of me (in red) and my best friend (in black) on vacation. No makeup. No touchups. No photoshop. Just two nice women enjoying one last hooray before my best friend marries the man of her dreams. Now why in heaven’s name should culture dictate that either of us needs to apologize for not being perfect enough for the equally imperfect men trying to date us. I’m a nearly 30 year old, undomesticated, slovenly wreck. Last weekend, I did not speak to or listen to anyone the entire day. Silence is luxuriant to me; it’s better than than dipping into a warm bubble bath. I just had a very emotional weekend. On Friday, my cell phone went bizerk in front of the Grand Poopahs of the Establishment, and I lost every single voicemail, video and picture I had saved to my cell phone of my Dad. It took HOURS to recover them thanks to brilliant folks at the Apple store. And I have been in a first rate funk ever since. It’s just all so hard. Single handily running a household is hard work. I look back out how bright pictures of me from a few years ago looked. I glowed. The glow of a girl who has the wind always at her back. I still smile with my soul, through my eyes, but I haven’t glowed in awhile. So, this weekend, I’m trying yet another intervention. I’m trying out a CrossFit. I have to find a way to feel better about myself. I need the endorphin crack. I need to loose this ridiculous weight that is slowly edging me out of the gene pool. And mostly, I need to laugh again. The laugh of a happy girl rather than the sigh of an overworked women. I don’t know what combination of interventions its going to take to get me back to normal. MollyMaids cleaning my house. Vacations. Exercise. Hugs. Something. I need professional help to whip my house and my physique back into shape. But this time next year, I’m going to be the women I want to be, so help me God, I’ll be her. I have 12 pillows on my bed. I am the only person who sleeps in the bed. Nobody has even seen the master bedroom in my house for probably a year. What is wrong with me? Isn’t it interesting how much pressure we put on ourselves to achieve Martha Stewart perfection in a NASCAR speed world? I realize that I am completely overwhelming myself on things that don’t matter. Not even a little. Shams are a sham, and I am empowering myself to purge them. Finally. My sanity is worth more than 10 decorative pillows. Tonight, I plan on going Freddy Krueger on ten or eleven of my pillows, and ditching the extra fluff in my world. I wonder what else I can purge. Suggestions? Well, so what happened was is I thought it would be a great idea to start working on my running again. I was introduced to a trainer (who makes Jillian Michaels on The Biggest Loser look like a saint), and the we decided the first step would be to actually run a race. I regularly run 5k, but I am terrified of running a race. What if a hill takes all my energy away? What if all I can see if the distant backsides of runners who dashed ahead of me, and who actually deserve to be called runners? What if I just stink at it? So, to be supportive, my trainer said he had a few weekends open, and if I would find a race, we would run it together. Low and behold, the weekend we are both available, there is a 5k run to raise money for Duke’s Brain Tumor Research Center. I was so excited. Running a race to raise money for the group that created the drugs that allowed my Dad to meet his first grandson was going to be more than a jog in the park, it was going to be therapy for me. It felt like a way to honor my Dad, to challenge myself, to take a small step towards acknowledging the chasm that loosing him left in my life, and to be surrounded by people who also know how that feels. So, in my excitement, I posted on Facebook about the run. Dun, dun, dun… And a lot of people decided they wanted to run it with me. Not 2 or 3 people, but 2 or 3 dozen people. Yikes. I’m a little intimidated by hosting that many people. I have no idea where I’m going to put all the out-of-towners in my 1400 square foot house. Mostly, I’m terrified I won’t be able to run well in front of them. Pride is so ugly. But, overall, I am overwhelmed that so many people would support me, and honor Dad. My brother and his family are flying in, friends from our home town, friends from college that work in DC and New York now, and so many friends from along life’s way. I’m hoping it’s going to be lots of fun. I’m hoping I don’t break a leg or burn the dinner. But, mostly, I’m hoping I’ll feel close to Dad for the day, and in my own little way, get another chance to say thank you to him. A few days ago, I was talking to a friend about strength, kindness, and the long journey towards healing after several years of big losses in my life. In the past 3 years, I have lost my father, my boyfriend who was the love of my life (the one before rebound Joe), and a dear friend. Some of those losses were catalyzed by cells growing in his brain and others by bullets to their brains, but all of those losses were enough to bring you to your knees pleading for more merciful years to come. I have to believe that I am a gentler person for these losses. I would rather not know such pain, but since I do, I might as well use it to make the world a kinder place. It was in this discussion that my friend shared with me words that have brought him comfort over the years. It’s from a poem that starts out, “Before you know what kindness really is, you must lose things.” Before you know what kindness really is, you must lose things. That struck me so profoundly. It’s not only talking about the vacuum that exists after loss that others try to fill with kindness. It’s very true that kindness towards you is most profoundly felt when you’re alone in the chasms. But it is also talking about the familiarity with that vacuum that makes you more capable of empathizing with other’s loss and navigating with them through the chasms. You walk more softly because you are more sensitive to the world around you, the weight of your feet pressing down, and the support of your hand when you hold it out. Without the familiarity with loss, there would be no need for giving or receiving kindness. It’s been a few years of extreme loss, but I am fortunate to say that it’s also been a few years of extreme kindness. I now can open my eyes and see my suffering was not alone because those that shared kindness with me had also known loss and pain at some point in their lives too. The revelation that we are all in this together was so comforting to me. And the knowledge that my loved ones live on by walking beside me as I offer love and compassion to others brings me hope. I shamefully abandoned my blog. I’ll never been one of those dedicated writers because I write for reasons not well suited for blogging. I wish I could be one of those folks that aims for a post a week with 500 or 50,000 hits. But alas, I’m just a run of the mill writer who needs some verbal vomit space every once and awhile. This weekend I went to my first big music festival without my Dad. I woke up to the sound of my Dad’s mandolin in the room next door, but the mandolin played a sweet melody by hands still warm with life. I walked in the adjoining hotel room to see a grown man smiling through tears as he plucked out a melody worthy of serenading angels (hopefully, my Dad). It sounded beautiful. It felt lonely. We also had the experience of being treated poorly at the festival. This would have never happened with my Dad there. He didn’t need to use prestige, connections or power to make people treat folks right. His very presence in a room commanded that people treat others with more respect and kindness. Not just towards him, but he raised the bar for everyone’s interactions with each other. I never imagined that I could still miss him so much. I never knew that seeing my brother and his wife pregnant again could fill me with the hope of new life, and the dismay of how randomly cruel it can be. Their new child is expected to be here on the anniversary of my Dad’s passing. My dad should have met this baby; he should have been able to sing her to sleep at night too. I never imagined his life could be cut so short or loss could cut so deep. At the end of the weekend, we listened to some great music and hugged lots of friends. It’s wasn’t necessarily easy or graceful, but we survived. Sometimes surviving counts as success. As I was once promised, it never hurts less; it just hurts less often. I could care less about Christmas this year. This little elf has been struggling. Yet, in an effort to press onward, I decided that I would put up one Christmas decoration and see if Santa could send me some Christmas cheer. My starter ornamentation was a snowman. He was a few feet tall with a carrot nose, a Christmas vest, and green trousers to round out his belly. I set Frosty up in my yard before work one morning, and pulled out of my drive way smug with the success of being the only neighbor with even an inkling of Christmas cheer this year. Frosty wasn’t so bad. Maybe I could do this Christmas thing this year. But then I arrived home. And what to my wondrous eyes did appear, but Frosty had dropped his drawers while I was at work. Apparently, Frosty had packed in one too many snow flakes, and the velcro holding up his pants gave way to the pressure. His drawers had dropped, and so had the gavel with the homeowners ASSociation. I walked up to my door to read a notice about the importance of maintaining yard ornamentation in keeping with the spirit of the neighborhood. Bah. Humbug. Needless to say, I didn’t trim a tree, or deck the halls, or put out cookies for Santa this year. Even though I have to roll my eyes at the HOA, I think Frosty dropping trou in my front yard was about all that really brought me joy at the holidays. It was a good reminder to laugh some- life’s short. I definitely want to the neighbor celebrating the snowy moon (in the sky or on Frosty’s behind) rather than the Scrooge writing a stuffy letter about Frosty’s pants. Looking back, the sheer absurdity of that level of Scroogery was about the only way I was going to put my Scrooginess in check this year. I guess sometimes we get what we need– not always what we want.